It's been a long week. I had plenty of rest and relaxation so I'm back to full power today! Anyways, sorry for the long wait, here's Sequence 8, the chapter for those who were dragged through time. 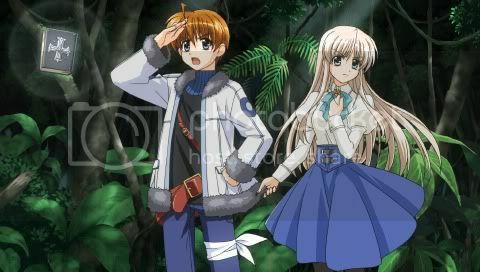 The Sequence start with Thoma and Lily wandering in the forest. Lily can't think of this world as anything else but in the past. Thoma FINALLY gives up and accepts the truth. In any case, they would need to find a way to come back since everyone in the future would be worried. Lily asks the Bible of the Silver Cross for any findings but the book is still in investigating for a way. Thoma encourages it, saying that 'Ginjuuji' (Silver Cross) the only one he can count on in this situation (He does wish he brought steed along though. Too bad, Thoma. Another voice actor would be an unnecessary burden on the budget. ). They decide that since Nanoha and the others look about 10 years old here, it should be around 15 or so years ago, around the time when Thoma was born. Lily asks Thoma if he wants to visit Vaizen, his home world where his town was destroyed by Eclipse infectees. Interestingly, Thoma doesn't even take 5 seconds to decide that he doesn't want too. Sure, it was a hard past, but he doesn't want the present he is living in now to change. Lily asks if the future would change if the past is. Thoma tentatively affirms it, saying that how it usually go in the several theories in fiction. He doesn't want to end up not meeting Lily and the others. Lily agrees that she doesn't want that. Thoma reminisces about the people in the future. 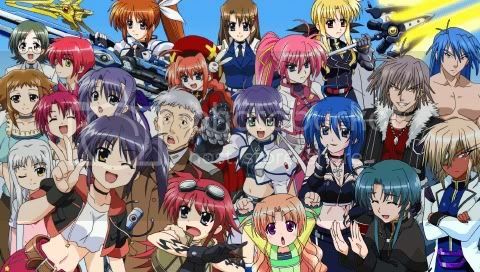 Su-chan, Nanoha and the others. Even Commander Yagami, who he's a uncomfortable with... And then of course, his older sister harem, old man Genya and even the Huckebein. He wants to go back for them. Silver Cross suddenly detects something. The two decide to set up and face it. Much to their shock, they see a Thoma clone sporting the much darker version of the Kurokishi (Black Knight) Mode. The Dark Piece Thoma speaks in a creepy monotone version of the Silver Cross' speech in terminator mode. A Dark Piece version of Lily is even merged with him. Thoma asks if he acts like that if reacted and Lily of course denies this, saying Thoma is much less serious, but that's not the point! She thinks this is a future version of Thoma that completely fell to the Darkness of the Eclipse and ended up killing everyone, protagonists and Huckebein alike, to surviving completely alone. Thoma says that this reminds him of when he first activated that mode. This is what Nanoha and the others must have seen before they got to save him. The Dark Piece starts going to combat mode. Thoma won't let it and tells Lily that they'll show what a REAL React is! They setup and start the fight. It ends in complete victory. (Douda?! Kanzen shouri!) He an Lily note that this fake's combat pattern is old. Despite all that power, he never got any formal training. The Dark Piece Thoma apologizes to Lily and vice versa before fading away. Teo (Asteon) and Kris suddenly detect 2 approaching signals. Vivio is slightly excited that it could be her mamas in loli form. Einhart takes the more practical approach and suggest they setup and confirm first. The 2nd match for this Sequence is either Vivio vs Dark Piece Einhart or Einhart vs Dark Piece Vivio. If you pick Vivio, you'll see a version of Einhart sporting a darker coloration and a much colder personality. Dark Piece Einhart doesn't know who Vivio is but recognizes her as a Strike Arts user, requesting for a match. 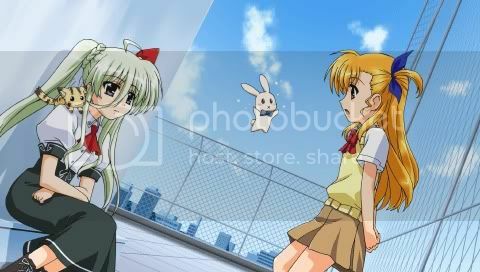 Vivio realizes this Einhart is from the time before they met, where the latter was all alone and stuck in a downward spiral of seeking strength. She tries to communicate but Einhart, or rather, Heidi E.S. Ingvalt of the Supreme King Style starts the match after announcing her title. She seems more than a little disappointed with the loss and disappears. I have to say this. I have to get this off my chest... Vivio! She... Her adult form... AHH! Damn it! She JIGGLES!!! I know! Don't give me those weird looks! She has the second most noticeable bouncy action in the game, the first place going to Arf. Well, I don't mind if it's from the familiars. Arf's is perfectly expected and Rynith's (Yup, her too.) occasional ones are nice. But Vivio's freakin TEN! My face twitches in discomfort whenever the screen closes up on Vivio during cutscenes and pre-battle poses. Damn it all, 7Arcs! Onto our more modestly-dressed loli-turned-adult. Einhart finds a Dark Piece Vivio in the full Saint King colors (oddly enough, you can't select any of these in versus mode). Vivio calls Einhart Onee-chan and is hurting, searching for her Mama. You'd actually feel sorry for the poor kid here. Kaori Mizuhashi does a very convincing anguished loli impression. Apparently, Einhart has heard about the Saint's Cradle incident and Vivio's involvement with it. Teo meows once and she agrees. Even if this is an a fake, she would never leave a suffering Vivio alone like this. She kindly tells her opponent that it's alright and she will save her. After defeating her, Vivio vanishes, still searching for Mama. I love Einhart. Well, I kinda like her normally in the Vivid manga. But I LOVE her in this game! (As a playable character of course. Stop staring. ) She's easily one if the best, if not the best melee fighter in the game. Her movements are quick, fluid and devastating, normally doing more damage than even Signum or Vita in melee! With the proper skillset in versus mode, I usually tear an entire 1/3 of an opponents lifebar in a single melee combo, even going as far as around almost half!!! And to add to that, her ranged skills are ironically some of the best counter-style moves you can use for a majority of the characters in the game. And now that I've started, I'm gonna make a little summary of more of her lovable brokenness! Her triangle skill, 'Senshouha' catches almost all special ranged/charging attacks except binds. Whether it's a Divine Buster, Plasma Slicer, Arondight, Kouyokuzan, Hiryuu Issen, Swalbe Fliegen, Thunder Rage, Yuuno's Shield Charge, Shamal's Tornados, Vita's Gigant Hammer Rush, Zafira's freakin Rider Kick, Nanoha's Full-charged Hyperion Smasher(!!!) or the Arthra's kitchen sink! You name it, you throw it at her and just watch and see as she catches all that energy and throws it right back at the your face. PWNED. Only a few characters like the Lieze twins/Zafira can effectively counter this with their own counter moves or Stern's multi-hit Blast Heat/Vita's two-step Raketen Hammer charge can repel it safely. It's one of the most hacked skills in the game considering it also has an ample casting time and a massive invincibility frame once the attack is caught. Her ranged circle, 'Tsunagarenu Kobushi', instead of helping her get free from a bind gives her Super Armor so she doesn't flinch nor get caught in binds for a limited amount of time. You only get knocked out of the mode if you get hit by a melee attack or when Einhart's interrupted when using a different skill. Believe me, it's very darned gratifying to just power through Shamals' impervious Cyclone Barrier without flinching to deliver the smackdown. Her ranged square, 'Kuuha Dan' is a simple wind projectile but she rushes in as well when charged. Not powerful at all but useful in closing the distance. It can also cancel out weaker attacks like when she just punched through Nanoha's Photon Smasher in the manga. The two regroup, confirming that they met Dark Piece version of each other. All too soon, another alert comes from the 2 plushie devices. This time, there is only one signal but it registers as 2 beings.. Which means... THOMA! For the third round, you can pick Vivio vs Thoma or vice versa, with varying dialogue depending on who you pick. Oddly enough, you can only pick the loli in Einhart's case. This is for if you pick Thoma vs Vivio. He immediately recognizes Vivio but the latter does not. Vivio is confused if he is really Thoma when he identifies himself. Lily says that she's here too. Vivio thinks the other is a Unison Device but Lily corrects her, she's a Reactor Plug. Thoma: No, that's not the point! Lily: Ah... maybe a fake? Thoma wins. Lily even goes as far as say, "Pipee~!" and announce him the winner. Vivio whines cutely that she lost. Despite the win, Thoma complains that he's hurting all over. Lily praises Vivio's counter skills. Vivio indignantly says that she has a mountain of things to ask him. Thoma apologizes. Vivio asks when Thoma since when he learned transformation magic. He already showed Vivio this combat form. But Vivio insists that the Thoma she knows is smaller since they are only 3 years apart in age. Thoma thinks he's just comparing him to Erio who is a freakin height vampire but Lily asks how old Vivio is. She's 10, and the Vivio the other 2 know is already 13. Lily: Ah... It's me! It's Lily. Lily: Shokku! Vivio forgot about me! Thoma: No... There's no way. The Thoma that Vivio knows is not a combat mage and doesn't know how to fly. She's very uncomfortable about his big weapon and appearance. The two parties wonder if the other is a Dark Piece and the battle begins. Once you wins, Vivio is amazed that Thoma has become this strong and scary. Lily remembers Vivio moved better than the one they fought but the loli was still able to avoid attacks well. Well, apparently not good enough because Vivio starts complaining that Thoma's hurting her. (Thank the producers that Vivid/Force Nanoha is not here, Thoma. Reactor or no, she WILL blast you silly for laying a hand on Vivio. ) Thoma is surprised and Lily apologizes, demanding that Thoma do the same. Vivio wonders if Thoma is real and of course still doesn't recognize Lily. With Einhart, Thoma recognizes her too. Of course, she doesn't know them. Lily thinks it's because of Black Knight mode that she doesn't recognize them. Einhart is still clueless. Lily thinks it's weird and Thoma wonders if she's a fake. In any case, Lily knows a very easy way to find out and her partner agrees. Thoma: Ah... I'm Thoma Avenir of the Silver Cross Gunblade-style, AND! Lily: His Reactor, Lily Strosek! 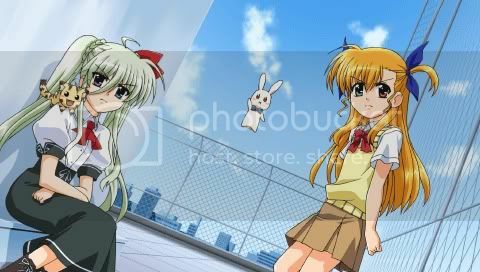 Einhart Stratos of the Supreme King Style, we request for a match! After the match, Thoma confirms that this striking/shock style is indeed Einhart. Like in Vivio's case, Lily finds her a little less skilled than the one they know. Einhart in turn says she's honored about the match. But she asks who they are, wondering if they are the perpetrators of the time warp. 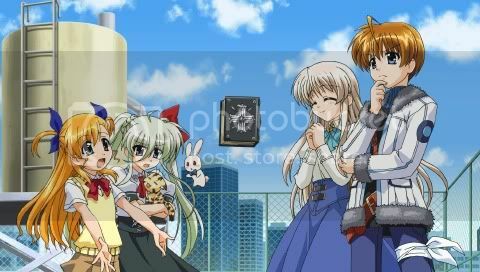 Teo meows and Lily notices her, saying that it is indeed Einhart. Silver Cross: The catlike biting is causing damage to the main body of the book. Requesting permission to eliminate the threat. Lily: You can't do that, Silver Cross. Einhart: Just as Kris-san said. (SHE UNDERSTOOD IT?! ) You can't bite Silver Cross-san. Teo, don't! Oh this is golden! XD The darned book that caused Thoma to collectively own the Aces and the Huckebein in a single attack, the great Bible of the Silver Cross' greatest weakness is a cat plushie biting it! XD Einhart really is on the path to being the Supreme King! Thoma: Lily! That way of saying it is just asking for misunderstandings! An important friend and my partner in our combi. That should be okay. Lily: Silver Cross is studying it. Teo-nyan, won't you come here for a bit? Lily: Is biting Silver Cross really good? Or maybe it's delicious? Einhart: Teo! Mou, get back here already! Einhart states that they've been doing their own research as well. Vivio follows up by saying that there are other time-travellers aside from them. They must find those people. The devices/Tome detect SEVEN signals approaching. They think one of them should be the time traveller and plan on getting to him/her. Thoma guesses that the others should be Nanoha and the others. He prays that Hayate doesn't come with them. Vivio and Einhart wonder if he has some trauma regarding our favorite raccoon commander. 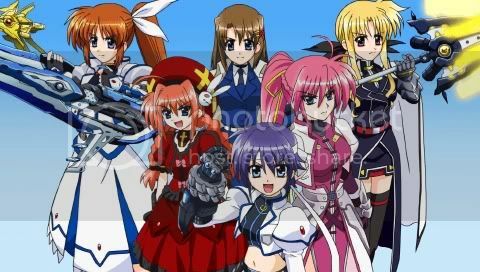 The group approaching has Hayate, Nanoha, Fate, Zafira, Yuuno, Vita and Kyrie. They tracked down the future kids with Pinkie's help. Zafira tells her to stay back since she's still in no condition for combat. Fate tells her to call if in danger. Kyrie thanks their kindness. Yuuno and Vita confirm the locations. Nanoha states the plan to talk with them. Hayate gives the order to move out. As you have noticed, this is only the 1st part of Sequence 8. My cousin had to use my computer for a Science assignment so I had to give it to her for a couple of hours. Sorry about this, guys. I'll continue with the second part tomorrow. Prepare to see fangirlism and determination (and horror for Thoma) from the future characters! Last edited by Aaron008R; 2012-01-03 at 06:58.